It’s Munich, but no…it’s Torii Beach in Yomitan. Oktoberfest is really Rocktoberfest, and it’s happening Sunday with ten bands, lots of delicious food, drinks and entertainment. Oktoberfest, the world’s largest bier festival, takes place in Munich, Germany, but Army Morale, Welfare and Recreation at Torii Station is bringing Bavaria to the beach. The event is free, and open to everyone, giving both Okinawans and Americans the opportunity for a festival get together on the beach. Ten bands, including local Okinawa City favorites 8 Ball, F.O.D. and Liberty Risk will be performing, along with Bleach, an all girls band, Electric Eel Shock, Noiz as Hell and Chuck-wow.. Jigokuguruma and Fake Kingz will put on a couple great shows, while Spice Records heavy weights Abiroji will finish up the evening entertainment. “These are bands that most of you have seen downtown playing,” says Army MWR’s Greg Barron. 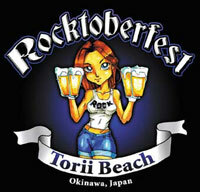 “Now we have them on one stage, making Torii Beach the perfect place to be on Sunday.” Rocktoberfest runs 3 p.m. to 11 p.m.
Justin Evers, the MWR chief, says “The event is perfectly set on a Sunday before both a Japanese and American holiday, so everyone is off on Monday.” Evers promises “it will be a great time.” Parking is available on the beach, says Barron, “but people can park up on the old Yomitan air field, where we’ll have a shuttle bus service to the beach.” He notes the Torii back gate will be open, and there will be both taxis and Daiko service to ensure no one is driving after drinking.